Here are the Jolis Pas Beaux's cousins: the Jolis Trop Beaux! This activity toy is made of colourful materials to stimulate baby's sight and touch: fur, muslin, checked jersey and printed cotton. 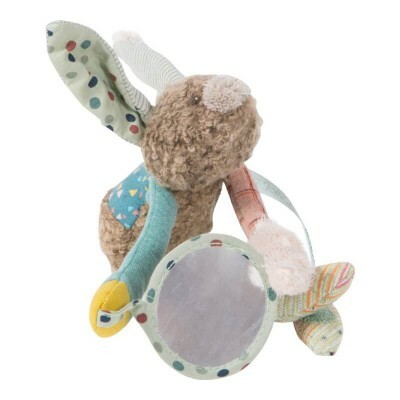 This rattling rabbit has a mirror to promote self recognition and crackling ears. Easy to grab by small hands, this rattle / soft toy / activity toy will entertain baby! Dimensions: 22 cm. Materials: cotton, polyester, elastane, acrylic, linen, plastic. Surface washable. No tumble dry. Suitable from birth.